I posted this note on Facebook on Nov 30th, 2013 and thought it is worth re-posting here again outside of FB’s wall. 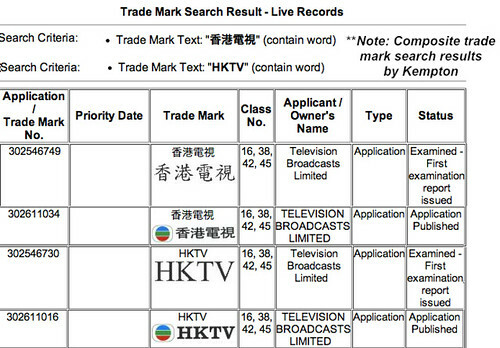 Why would TVB, the dominant TV broadcaster in HK, think it is a good idea to include “HKTV” or “香港電視”, a new competitor’s name, in four registered trade marks applications? What legal strategy is TVB deploying? On the surface, TVB seems to be behaving in a very petty manner, is it true? In the short term, we are already seeing the negative publicity from being discovered and now reported by local media (see Apple Daily “TVB台徽配HKTV申請註冊商標 無綫強霸港視台名”) that TVB is willing to use “tricks” (some may say “dirty”) by applying for these trade marks and try to “occupy by force” (強霸) a competitor’s station name just seems to add oil to the red hot fire of TVB hate! Do the TVB lawyers think there are not enough TVB haters and they want to create more? In the long term, even if TVB was to be granted the four registered trade marks containing “HKTV” or “香港電視”, what would TVB do? Were TVB lawyers really thinking they could help “win” against a new competitor by stripping HKTV’s rights to use its name on “calendars, books, catalogues, postcards, posters … greeting cards; wrapping paper and packaging materials; bags and envelopes …” (class 16 protection specifications)?! If TVB had the trade marks granted, would they start to enforce the trade marks and sue HKTC for trade mark infringement? Really, are you kidding me?!! 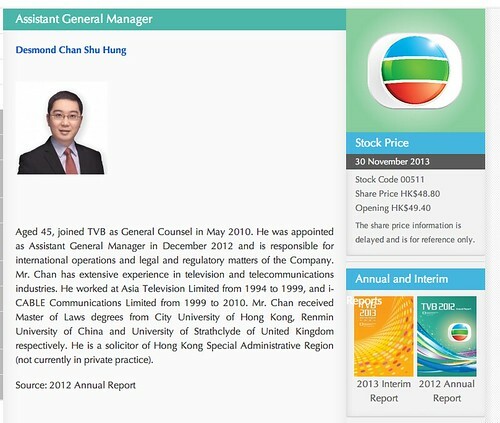 One of these days, TVB shareholders may want to hold TVB lawyers, and ultimately Assistant General Manager Mr. Desmond Chan Shu Hung (陳樹鴻, responsible for “legal and regulatory matters”), accountable for not thinking through the pros and cons of their actions in trying to “HKTV” and “香港電視” as trade marks. It looks like these actions can be seen by some as harmful actions that hurt the TVB’s brand in both the short and long term. And push TV viewers further away from TVB. P.S, I am not a lawyer and I have never played a General Counsel (法律總顧問) on TV. But thanks to my GC blog friend Mike, I have the pleasure since 2006 to read and re-read the insightful “Reebok Rules” by John B. Douglas,III (who was Vice President and General Counsel of Reebok International in 1992) many times over the years so I do try to think like a GC sometimes. Feel free to read my 2006 article re “Reebok Rules”. P.S. Here is a Google web cache version of the full “Reebok Rules” as I can’t seem to find the original American Corporate Counsel Association (ACGA) version of the PDF file any more. 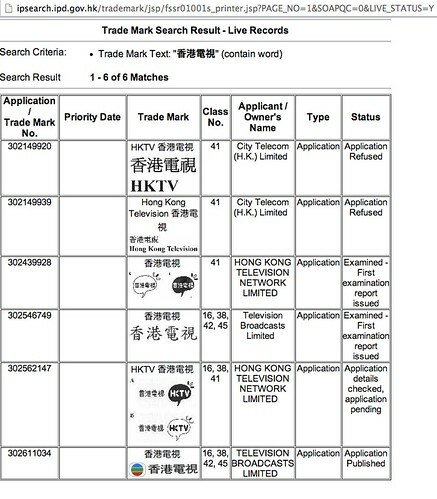 Note: For the record, I have to mention trade mark application 302149920 for the words “HKTV 香港電視” by HKTV (or its former entity “City Telecom (H.K.) 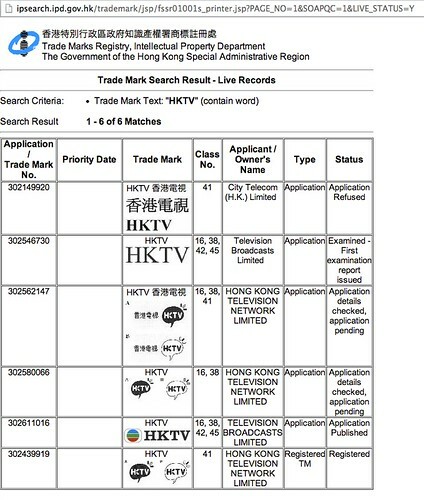 Limited”) has the status of “Application Refused” in the Trade Marks Registry of the HKSAR government. While I have no access to the rejection documents and rationale, it makes sense to me a very general name like HK TV is refused. Quoting McMillan, “The strongest marks in a legal sense are ones that are unique. In that regard, coined or invented words are often preferable to marks composed of ordinary words.” Applying this thinking, you can’t really get more ordinary than combining words like HK and TV. This is an interesting discussion in itself and I will leave it for another day.